In the Room. Photo by Jeremy Daniel. BOTTOM LINE: This writers' workshop drama is thoughtful and full of potential. 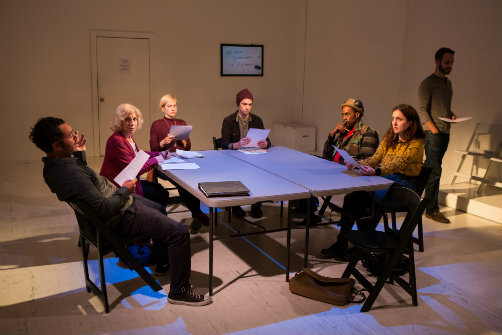 Anyone who has ever taken a creative writing class can relate to the setup of Lawrence Dial’s play In the Room: a bunch of people gathered around a table, writing about influential events in their lives that have shaped them. They’re writing letters to people from their pasts as they sit in folding chairs in a white box rehearsal room. The group of writers is diverse, in a sort of mismatched way: Herman (Reuben Barsky), Scott (Jacob Perkins), and Lydia (Chelsea Melone) are millennials, Clementine (Susan Neuffer) is in her golden years, and Rainer (Suzy Jane Hunt) and Jesse (Robert Karma Robinson) are in between. They come from different places, classes, and social backgrounds. But they all want to learn to write, or improve their writing, and Seymour (Matt Harrington) is there to teach them. Described as a washed-up playwright, he had one notable hit back in the day, and now he has a family and teaches writing. (Specifically, it’s a playwriting workshop.) Rainer (Hunt) is a friend of Seymour’s from their younger days. She was an aspiring actress who appeared in the aforementioned hit play, but then got married to a movie star and had kids. Directed by Adam Knight in a naturalistic style, the play seems to have been written to take place in the theater space where it is playing at the Alchemical. We see glimpses of each session, discussion about writing exercises, as time passing is marked by moving chairs and shifting coffee cups and costumes. Time shifting is also marked by a sort of percussive slamming of chairs around the table. The lighting design by Lauren Duffie and costume design by Kristina Makowski are particularly impressive in the minimal space. The core story is focused on Seymour and Rainer, on their maybe past romance, and on Rainer’s development as a writer. Is she actually a good writer or just a frustrated housewife looking for an outlet? Is Seymour in love with her, or does he wish she wasn’t taking his class? There’s also a lot of time spent on Rainer’s unseen husband. The romantic elements of this story could seem contrived in the hands of lesser actors, but Harrington and Hunt are the standouts in this cast. They each give warm and engaging performances that show many layers to their individual characters. I felt I really knew who each of these people were after two hours. The rest of the characters are given less development, though all the actors are strong. We get to know a little about Jesse and Clementine’s backgrounds, and their own personal family tensions, but even less about Scott, Herman, and Lydia. Personally, I would have liked to have seen more from these smaller characters, as they were each so unique and interesting. Rather than speeding through the days and seeing who didn’t have their writing done, I would’ve preferred to learn more about who these people are. There are a lot of different ideas in this play, all of them engaging and entertaining, which makes for a swift and enjoyable evening of theater. The dialogue feels true to life, and there are some really funny and moving moments. Some of the overall themes are lofty, such as the meaning of being a writer and a creative person. Dial also touches on subjects like adultery and consent in personal relationships, and the idea of personal growth through writing and through personal relationships over a period of time. There’s a lot of fertile material here and I would be interested in seeing future incarnations of this piece as its themes and characters are developed. In the Room is by Lawrence Dial. Directed by Adam Knight. Lighting Design is by Lauren Duffie. Costume Design by Kristina Makowski. Sound Design is by Toby Jaguar Algya. Compositions are by Josh Kight. Stage Manager is Sarah Machiko Haber. The cast is Reuben Barsky, Matt Harrington, Suzy Jane Hunt, Chelsea Melone, Susan Neuffer, Jacob Perkins, and Robert Karma Robinson.